But this time it’s not simply as an instructor at the Genealogical Research Institute of Pittsburgh, but also as a student. I’m brushing up on my DNA education and skills in the Practical Genetic Genealogy class here at GRIP. In my spare time here2 I’m also teaching in the New York track coordinated by Karen Mauer Jones and in the Advanced Land track coordinated by Rick and Pam Sayre. Where a question arose that needs a bit more of an answer. What’s the difference between a lien and a lis pendens? They’re both things we come across in land or property records, and both of them represent claims against the property, but there really is a big difference between the two. So in the lien situation there has to be a debtor-creditor situation. For example, if I do work on your house or your car, and you haven’t paid me for it, I’m your creditor, you’re my debtor, and I can file a lien — a claim — against your house or your car for payment of the debt. 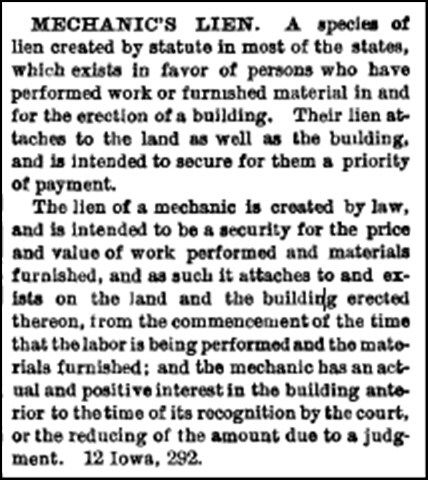 A species of lien created by statute in most of the states, which exists in favor of persons who have performed work or furnished material in and for the erection of a building. Their lien attaches to the land as well as the building, and is intended to secure for them a priority of payment. So think debtor-creditor every time you see the word lien. A lis pendens, on the other hand, is filed — or is created automatically — when a lawsuit is started that has to do with the land, and usually with the title to the land. There isn’t a debtor-creditor situation; there’s an actual dispute over the land itself. An example would be where you and I enter into a contract for the sale of a 100-acre tract of land called Blackacre. You’re the seller, I’m the buyer, and you conclude down the road that I’m not living up to my end of the contract. So you cancel the contract and proceed to contract to sell Blackacre to someone else. If I sue you for breach of my contract with you, I want to make sure that someone else — the would-be buyer — is on notice of my claim. I would do that by filing a lis pendens. Sometimes just filing the lawsuit against you would act as a lis pendens. So think notice of a lawsuit when you see the term lis pendens. Both focus on property, both involve claims against the property, but one involves debtors and creditors and the other involves lawsuits. There isn’t a debtor-creditor situation; there’s an actual dispute over the land itself. As in most such things, kinda’ sorta’. Your example would probably be treated in equity as a foreclosure action (at least in Florida and most other states). Adding a mortgage to your scenario should be familiar to everyone. When a borrower gives a promissory note to a lender on a home loan, the lender is secured by another contract, the mortgage. The lender a lien-holder. If the borrower defaults on the note, the lien-holder will seek foreclosure under the mortgage by filing a civil complaint along with a lis pendens. That’s the way it would be done today. Historically it would have been different. I am interested to buy a foreclosure property, but I am afraid when I see lis pendens often times by the lender. Can someone please explain to me what are the risks and how it will effect the buyer? * Is there a time limit that the lien or lis pendens is active? For example, if the lien or lis pendens is filed 10 years back, is the buyer still liable to pay the amount? * How do we know if the lien or lis pendens is released? Nope, I’m afraid to get those kinds of answers — about a current legal matter of specific concern to you and posing risks to your legal situation — you’re going to have to consult with an attorney licensed to practice in your jurisdiction. This blog doesn’t, can’t, and won’t give legal advice. Thank you in advance for your response, I am looking forward to your answers as soon as possible. I have two questions, in Florida, does a the family court have the authority to allow a party to place a lis pendens on a homestead property, to secure the equity for a possible future money judgment that is not related to alimony or child support? Can a lis pendens ever be considered a security lien or a perfected lien? Thank you! These appear to be questions related to current legal issues and not to the legal issues encountered by genealogists in dealing with historical documents. I can’t, don’t and won’t give legal advice. See Rules of my road: 2019. To get answers you can rely on, you’ll need to consult with an attorney licensed to practice in your jurisdiction. I have a default judgement against my cntractor that uses his home residence as his work address. Can I place a lien or a lis pendens on his residence to collect the debt owed? I don’t/won’t/can’t give legal advice. (See Rules of my road: 2019.) For issues involved in current legal disputes, you need to consult an attorney licensed to practice in your jurisdiction.